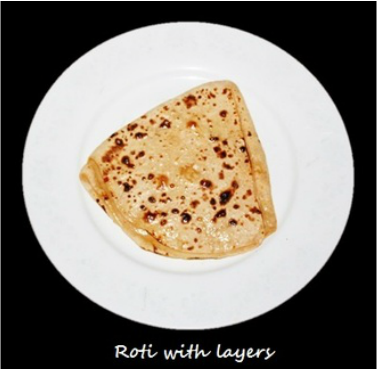 Layered roti is one of the tasty flatbread of India. 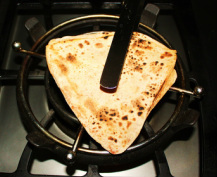 If you are bored with just plain chapatti, just by adding some oil and spices and making layers, it can become tasty crispy and flaky roti. 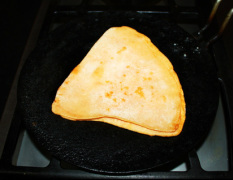 Layered roti can be made in triangular, round or square shapes. 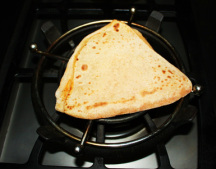 After cooking you can see several separate layers. The outer layers are crisp while the inner layers are soft. 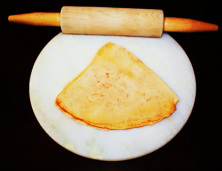 Layered roti is prepared with whole wheat flour dough. 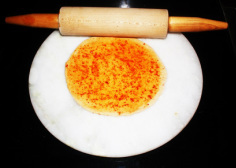 A small portion of dough is rolled in a circle then butter or oil is spread all over then circle, to make it spicy you can sprinkle salt and red chili powder then fold it into semi-circle then spread oil or butter and spices and fold again to give the layers then it is rolled into desired shape. 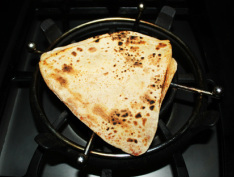 After rolling the roti is partially cooked on a hot cast iron griddle and then cooked directly over high heat. 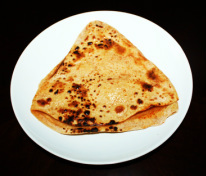 Once the roti is cooked they are lightly coated with ghee and immediately crumpled (by clapping it) to release the layers and served with any dal or vegetable curries. 1. 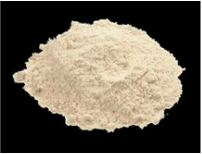 Place the whole wheat flour in a mixing bowl. 2. 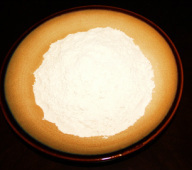 Add a little water at a time and mix it with flour in a rotating motion from the center of the bowl to outward until it form a dough and it cleans the sides of the bowl, knead it for few minutes, until the dough become soft and just the right rolling consistency. 3. Knead the dough with wet hands make a ball and put it back into the bowl, then cover it and keep it aside for at least half hour. 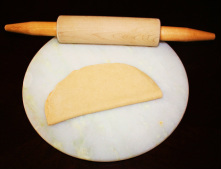 Dough maker or food processor could be used to make the dough. 1. 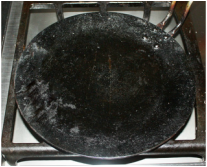 Pre heat the tava (cast iron flat griddle) on medium heat. 5. 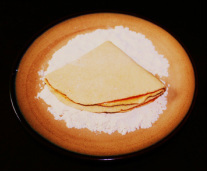 Place the ball of dough into the flour and press flat, dusting both sides. 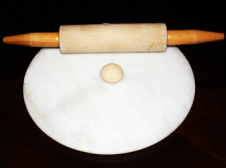 and with the help of a rolling pin (Belan) roll into a 6 “circle. 8. 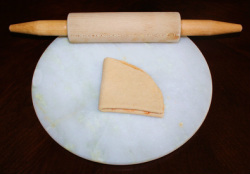 Fold the circle in half to form a semi-circle. chile powder the sprinkle now and mix with the fingers. 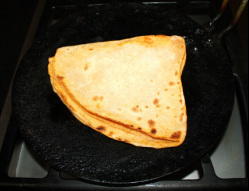 shape of roti is up to you the idea is to grease and fold to create layers). triangle with your fingers, dusting on both sides. hot enough, if it is too dark or burn, it is too hot, adjust the heat accordingly. both sides over the flame. cooking board to take the flour out,and then apply some butter or ghee. 1. 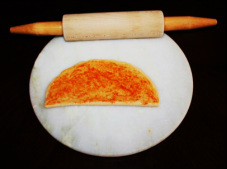 Layered roti can be made without red chili powder. 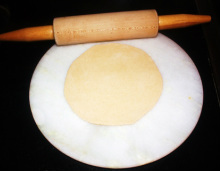 Once you rolled the dough into 6” circle spread half ½ teaspoon of oil over the entire surface of the circle and then fold the roti.